Lee Carroll, who channels for Kryon, likes my film! 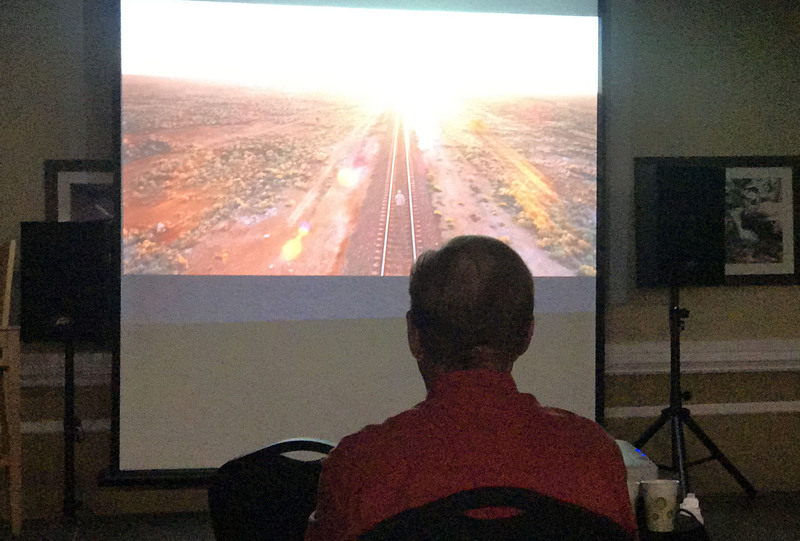 This morning in an auditorium south of Asheville in North Carolina, Lee Carroll and his partner Monica Muranyi watched my film – PGS – Intuition is your Personal Guidance System. If you don’t know who Lee Carroll is, well, he channels the spirit guide Kryon. Lee Carroll is one of the most famous channellers on the planet. He holds channellings and seminars all around the world to large crowds, some as large as 3000 people. He’s constantly traveling the globe, and his events and seminars are invariably sold out. Monica, his partner, has written three books, bringing together many of Kryon’s teachings into something akin to anthologies. They’re fabulous. – and they both loved it. He was particularly interested in what the Indian interviewees had to say – including His Holiness Pujya Swamiji Chidanand Saraswati, one of the spiritual leaders of the Hindu religion, and head of the Parmarth Niketan Ashram in Rishikesh, on the sacred Ganges. He’s a former award winning sound engineer for movies and tv, so his technical appreciation for what we’ve done was tremendous. He was impressed with the sound design, even though it’s still a temp mix. Wayne & Lib and your team – take a bow! So there you go. Very pleasing, and once again a huge relief for me. It’s nerve-wracking showing these people the movie. But so far the response has been very gratifying. During the two days at the event, Jennifer and I met quite a few wonderful people who have expressed great interest in the film, and have given us their details so we can begin to think about Cinema on Demand screenings in their towns and cities. Very nice Bill! When key contributors praise it, things are going well! haha – yes, it’s certainly encouraging George, thank you! We are so ready for a film of this type, actually I believe We need to see it and to let it permeate into our souls. By We and our, I mean all citizens of the World. Your timing for this documentary and its release is pure perfection and I believe it will be a immense success. Dear Arlene, like you I think the timing for this film is now right. I think THE SECRET went a long way to opening peoples’ awareness of matters spiritual, even though it was essentially a get rich quick flick – and before that WHAT THE BLEEP DO WE KNOW, and before that the writings of Shirley MacLaine. Each stands in the shoulders of those that have come before. Never any doubt here that this film is going to be a hit! Now, you’ve had barbeque in Kansas City, Southern Fried chicken and other soul food on the way and while in North Carolina. Now what? If your driving back to LA which is a long, long way you should swing low and take in Creole food in New Orleans! IMO this Kryon entity is likely to be a demon. Even in Buddhism, a deva that acted in this manner would be considered as a direct hindrance to the seeking of enlightenment. Of course Lee Carroll likes your film – so does Kryon. It the time of much change Bill Bennett and your film is playing a part. Thanks Angie! I hope the film will play a part! Looking forward to catching up with you!